I received the mentioned products from ZipSign in exchange for an honest review. The opinions contained within this post are mine and may vary from the opinions of others. About ZipSign–We wanted to bring posters to a Taylor Swift concert, but they didn’t let us bring them past security. We decided to create something portable that we could use over and over again. 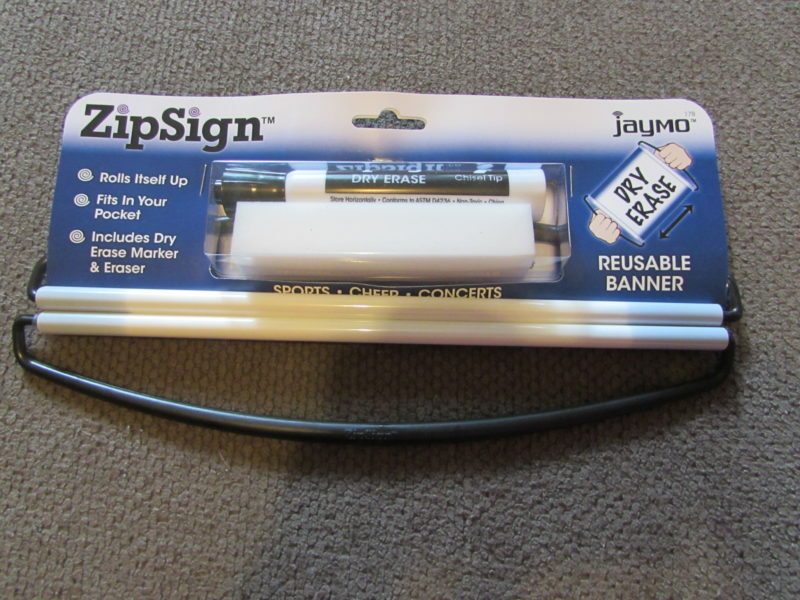 Two years later, we present the ZipSign Reusable Dry Erase Banner. I love products that allow my family to be creative, especially at events. We love to show our team spirit and also enjoy supporting family and friends in their own personal ventures. When I got the opportunity to review ZipSign I was really excited and my mind began to wander to places that we could use these. Concerts, sporting events, cheering on friends, our side business. Really the options are endless. I know my writing on this is TERRIBLE, but I wanted to exhibit how easy these are to use. The one above even has suction cups and I am already thinking that this would be great in so many places. I also adore the pink color. The price points for these products is great as well and range between $6.99 and $8.99 which makes them not only affordable, but when you factor in the amount of times that you can use these you are literally going to pay cents per use. I found that they are very easy to wash, do not stain and roll up so small you can literally keep them anywhere. I am planning on keeping mine in a bag that I carry to all of our business events and will be breaking it out quite often! If you are looking for a fun, reusable product to take to all of your fun events check out ZipSign. Be sure to give them a like on Facebook too!